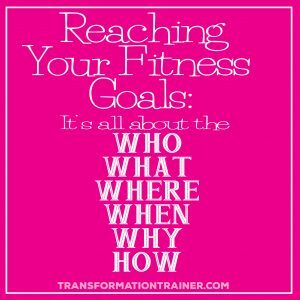 I get people asking me all the time how to reach their fitness goals. To answer that question, let’s take it back to grade school. Close your eyes (Oh wait, you can’t read this with your eyes closed…damn). Let’s try this a different way: imagine your small, adorable, third grade self, sitting in class, your gray-ish paper with the blue lines sitting on the desk right in front of you, pencil in hand. Remember the sound of your teacher standing in front of the classroom, droning on in his/her monotone voice about the 5W1H, the chalk screeching against the chalkboard as they wrote it for the whole class to see: Who, What, Where, When, Why and How. All good little third graders know they have to be included in every paper that graces the teacher’s desktop, right?! In fact, knowing the 5W1H of any given situation is critical to proper problem solving. We do it all the time without even thinking about it! So why, do we forget to apply them to our fitness? I dunno, but we do! So, let’s get back to basics, and apply the 5W1H to ourselves, shall we? First of all, WHO. Well that’s an easy one, it’s you! We’re talking about you here, not your friend, sister, mother, cousin or next door neighbor. The next w stands for WHAT. So, you’ve gotta ask yourself what you’re trying to accomplish. What are your goals? What do you want your end result to be? Do you want to run marathons, or just be able to play with the kids without being winded? The next w stands for WHERE. I want you to take this one and apply it a little differently than you might expect. So many of us, especially women, tend to compare our beginning to other people’s middle, or even end, of the road. You need to keep in mind that we are all on our own fitness journey. That being said, some of us are a little further down the road than others, and that’s okay! It never fails that when I’m showing my clients how to do exercises properly they say, “You make it look so easy!”, I just chuckle and tell them, “Trust me, my first set didn’t look like that!”. It’s all relative, remember that! The next one is WHEN. This one is pretty obvious, it’s all about time management. When do you plan to workout? What works best for your schedule? The last w is for WHY. Go way back to the beginning for me, back to before you began your journey to better health. Why did you start your new lifestyle in the first place, and why are you still doing it? Trust me, there’s a reason. Doing something new, like changing your lifestyle, takes thought, effort and work. These days, most of our lives are already brimming with things we need to do, and not enough time to do them in. So why rock the boat? Why add more to do’s to your already lengthy list? I’ll tell you why. There was something, usually a situation you found yourself in, that made you so uncomfortable in your own skin your brain finally converted all your wanting and desiring of a healthier you, into ACTION. What was it? Find it, remember how it made you feel and how you never wanted to feel that way again….that’s YOUR why. Finally, we have HOW. Once you set your goals, you’ve got to figure out how you’re going to reach them. What are you doing on a daily basis to get yourself closer to the end result? Are you making the right food choices? Are you staying hydrated? Do you have a set time for working out? What about your meal prep? Do you get enough sleep? Or, are you just winging it? Any long term, successful endeavor has to have a plan behind it. Can you imagine the General leading his troops into battle by saying, “Get your guns out y’all, we’re winging this one!” Not. A. Chance. You’ve gotta have a plan!! Go through and make sure your plan will help you be victorious! If not, what do you need to change?